I'm super excited to be guest designing with Jaded Blossom this month. I love their collection of stamps, dies, and treat goodies so much! 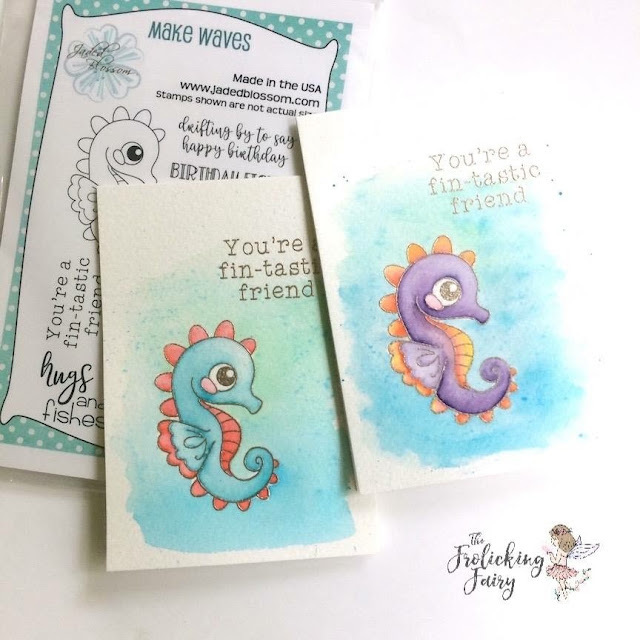 Today, I want to share a set of sweet, simple watercolor notecards I created using Friends are Rare, a freebie stamp from the July 2018 release bundle, and Make Waves. I used the Octagon Dies to die cut my watercolor notecards, making sure to leave the top fold of the card below the top cutting edge of the die. I embossed this beautiful sentiment in gold and watercolored the gems with a shimmer watercolor paint. For extra shine, I covered the gemstones with Glossy Accents. A couple wee rhinestones finished the cards. For the seahorse notecards, I cut a 5"x7" watercolor card in half, creating two top-folding 5"x3.5" notecards. I embossed both the seahorses and sentiments in gold and watercolored those sweet seahorses and an ocean background. Aren't they too cute?! Thanks for joining me! These cards have already been sent to some sweet friends; I hope they enjoyed their sweet surprise! Until next time.. get crafty!